Last year, I went bicycle touring in Italy with my son Shintaro. 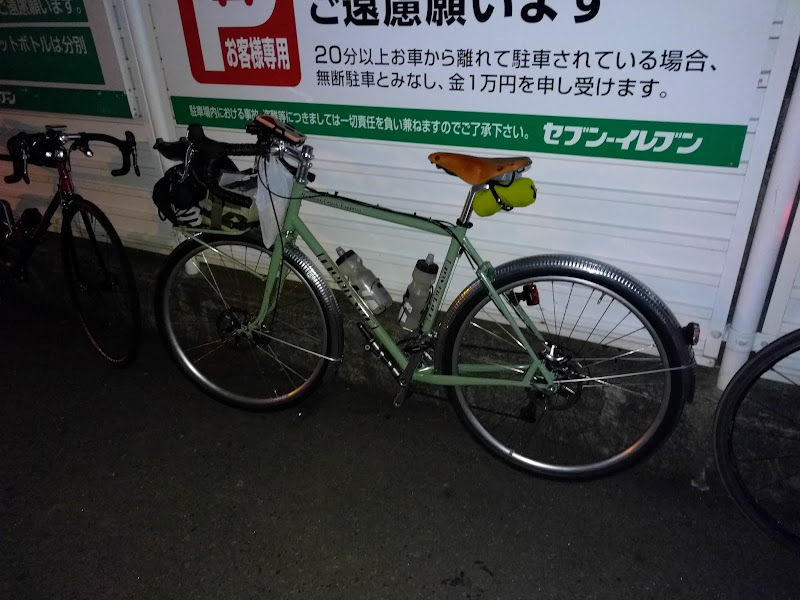 I borrowed his Araya Federal while he used his Panasonic touring bike. The Araya is an inexpensive randonneur bike that uses 650A wheels and down tube shifters. The fork with the front wheel and fender attached can easily be removed as a whole to pack the bike for travel by train or air. It performed very well for me. Unfortunately, on the return trip to Japan the front wheel got bent out of shape, probably by rough baggage handlers. I finally decided to get new wheels built for it by Tim Smith of GS Astuto in Kawasaki, near Tokyo. I received them last week. The wheel set is based on the 650B version (584 mm) of Velocity’s versatile Dyad rims. By switching the wheel size from 650A (590 mm) to 650B (584 mm) I will get a much better choice of tires on the Araya. I love my 42 mm Compass 650B tires! The brakes had enough adjustment for the slightly different rim size (3 mm less radius). The wheel set is built up with a Shimano DH-3N80 dynamo hub at the front I had already been using with my Bike Friday since December 2011. That was my first GS Astuto custom wheel. When I converted the Bike Friday to a disk brake at the front in 2015, Tim built me a disk brake wheel based on a Shutter Precision centerlock hub and the DH-3N80 became available as a spare which is finally being reused. The rear hub is a Shimano FH-RS505, an inexpensive 10/11-speed compatible centerlock hub available in a 36 spoke version. Its only drawback was that it’s only available in black, but Shintaro and I deanodized and polished it so it now matches the silver front hub. The Araya came with a 135 mm rear hub with an 8-speed cassette, but as a disk hub the RS505 is the right width and it works for 8/9/10 and 11 speed (give or take a few spacers). Because I specified a hub with both a spline for attaching a centerlock disk brake rotor and 11-speed compatibility, I am also able to install that wheel on my Elephant Bikes National Forest Explorer (NFE) if I need to. For now I’m only using the front wheel on the Araya to replace the damaged front wheel while the new rear wheel is doing duty on my Elephant Bikes NFE: As I found out earlier this year, my Velocity Blunt SL rear rim on the NFE had developed cracks around several spoke holes. This flaw is probably the reason why the rim was withdrawn from the market by Velocity soon after I had bought them for my NFE. Velocity will replace the cracked rim with an Aileron 650B, which wasn’t available at the time of my NFE wheel build. Until then I can use the new Dyad rear wheel built for the Araya as my NFE rear wheel, since the hub supports centerlock rotors. Once I get my NFE rear wheel rebuilt with the Aileron 650B rim, I will use the Dyad rear wheel with the Araya’s rim brakes, with the unused rotor spline hidden under a rubber cover. I also have a B&M Cyo Premium headlight to go with the dynamo hub on the Araya. 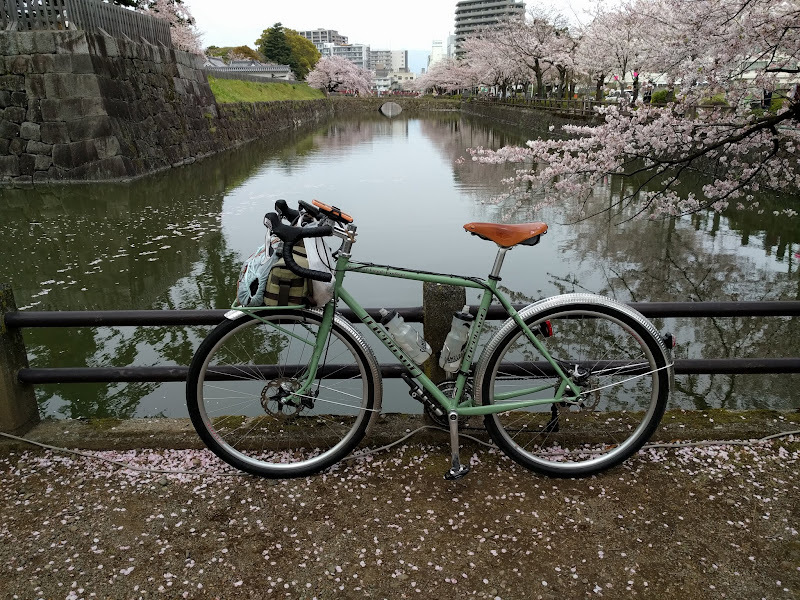 The easily removable front fork makes the Federal rinko-friendly, so I may be using it in place of the NFE on some long distance rides starting or finishing further from Tokyo. I needed to replace the rear wheel anyway because after 37,000 km its rim was worn out. The aluminium of the brake surfaces was already worn past the wear markers. I decided, this was a good time to switch not only the rim but the brake too. With disc brakes, a well built rim will basically last forever. The brake wear will be on the rotor, but that is a cheaper part that can be replaced without the need for a full wheel rebuild. But more importantly, disc brakes are much more effective in the rain, where they are more predictable. 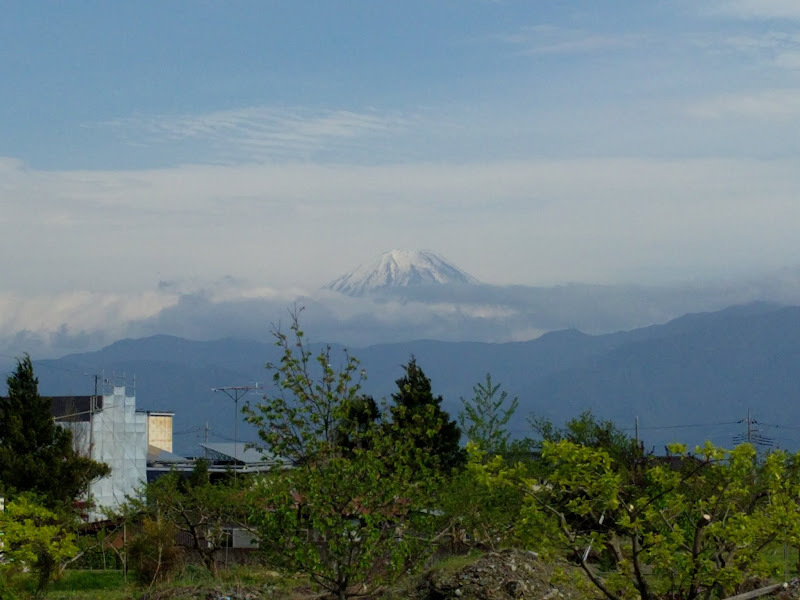 I was reminded of that fact again when I descended a winding 20 km from Mt Norikura in the rain last month. Originally I thought I could get IS disc tabs at the rear by simply swapping the rear triangle, which is a separate hinged part of the folding bike frame, but as it turns out Bike Friday needs to build the main tube and its hinge together with the rear triangle to ensure they will be properly aligned. I went ahead and placed an order. A couple of weeks later the new main tube and rear triangle arrived. Tokyo Bike Friday dealer ehicle will be swapping all other parts from the existing bike to the new hinged section that has the disc tabs. I bought a second Shimano BR-CX77 disc brake calliper. I still had a 140 mm centerlock rotor that I had bought two years ago as well as the matching IS adapter. The smaller rotor should be sufficient at the rear, especially with the smaller 20″ wheels. Heat dissipation should be less of a problem for a rear brake, which normally doesn’t have to work as hard as a front brake. I never had any heat problems with the 160 mm rotor at the front. GS Astuto, my favourite wheel builder, built me a new rear wheel based on the Shimano Deore FH-M615 rear hub and an AlexRims DA22 rim (same as originally came with the bike). The disc brake wheel uses an O.L.D. (Over Locknut Dimension) of 135 mm, but the existing rim brake rear triangle uses 130 mm. Therefore installing the new wheel in the existing frame before the Norikura ride required some effort, but it worked OK. With the new rear triangle that issue will go away. Once the conversion will be complete, I’ll actually have a spare main tube and rear triangle, a spare fork, two spare rim brakes and two spare hubs. The only frame parts missing to a complete non-disc brake frame will be the steerer and the folding seat tube 🙂 Nevertheless, doing it this way will have been worth it. Instead of buying a new bicycle, I could first try out at the front what difference a disc brake would make, making only the minimal investment. I never had to send my bike back to the US for a few weeks for an upgrade or pay shipping costs either way. I only lost the use of the bike for a short period for each of the upgrade steps. It looks like I get about 6,000 km of useful life out of the disc brake pads on the front of my main bicycle. That’s about 9 months for me (I ride all year round, about 8,000 to 10,000 km per year). Two years ago I switched my Bike Friday Pocket Rocket to a disc brake on the front by replacing the fork and the front wheel. 1 1/2 years ago I received my Elephant Bikes National Forest Explorer (NFE), a low trail randonneur bike with disc brakes. 9 Months ago I switched the NFE from TRP Spyre mechanical disc brakes with metallic pads to Shimano hydraulic brakes with resin pads. These pads had now worn out, see picture above. Along with the brake pads I also replaced the front rotor, as the old one had worn quite thin. Most of the 7,000 km that I had done on the TRP Spyre brakes I had been using metallic pads, as the factory resin pads wore extremely rapidly: I had to keep adjusting the brakes after each Saturday long ride (typically 130-200 km). The metallic pads needed less attention but were very noisy in the rain. My experience with the Shimano BR-RS785 brakes was much better. As hydraulic brakes their pads were self adjusting. There weren’t any noise issues. Wear is quite acceptable: One set of resin pads every 9 months is not too bad and I expect the new brake rotor will last even longer than 13,000 km / 20 months now that I am only using resin pads. On top of that the modulation on the hydros is great and they need very little effort. I could not be happier! Likewise, I regularly replace shifter cables (about once a year), before they wear out enough to break inside the brifters during a ride away from home, as happened twice to me before I learnt that lesson. In the past I have been quite easygoing about replacing worn out bicycle chains, but a chain that has “stretched” will wear out your chain rings or cassette more quickly. Chains do decrease in robustness with increasing numbers of gears (from 8 speed to 11 speed) as they increasingly become narrower, so I will probably be replacing my 11 speed chain annually too. I have finished a 400 km brevet, repeating last year’s success, after an unsuccessful initial attempt in 2014. BRM423 NishiTokyo 400 km Fuji Big Loop (BRM423西東京400km富士大回り) was my third brevet on my new Elephant Bikes National Forest Explorer (NFE), after a 200 km brevet in Izu and a 300 km one around Mt Fuji. Previously I rode all my brevets on my Bike Friday Pocket Rocket. 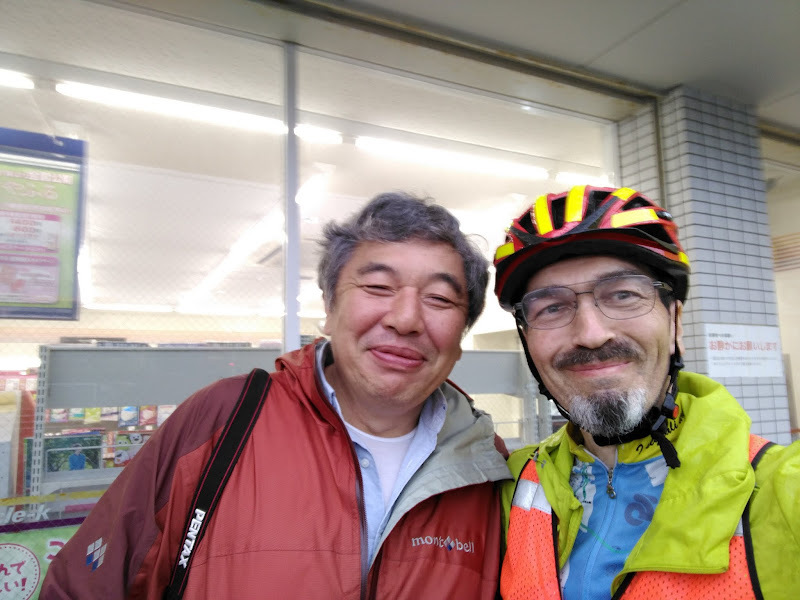 Like most brevets by AJ NishiTokyo this brevet starts and finishes in Machida. 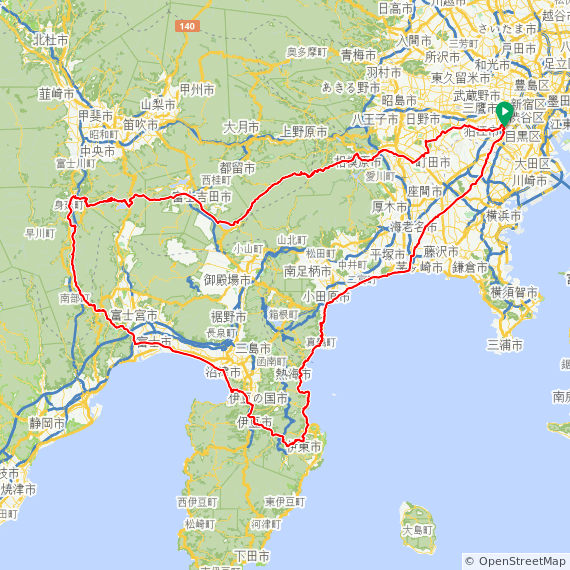 It heads out towards Lake Yamanakako via Doshi road, then via Lake Motosuko to Minami Alps City. 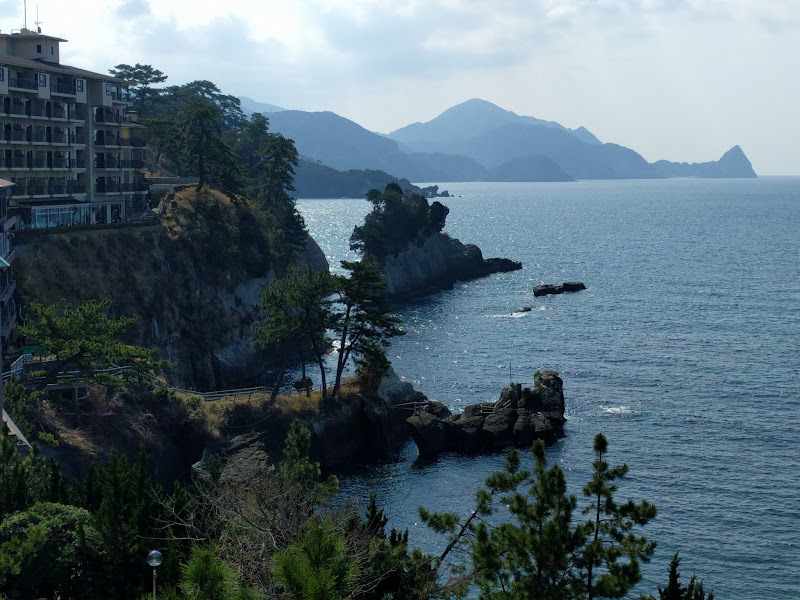 From there it turns down to the coast at Fuji City, crosses Izu peninsula via Shuzenji to Ito on the east coast and back up to Machida via Odawara. 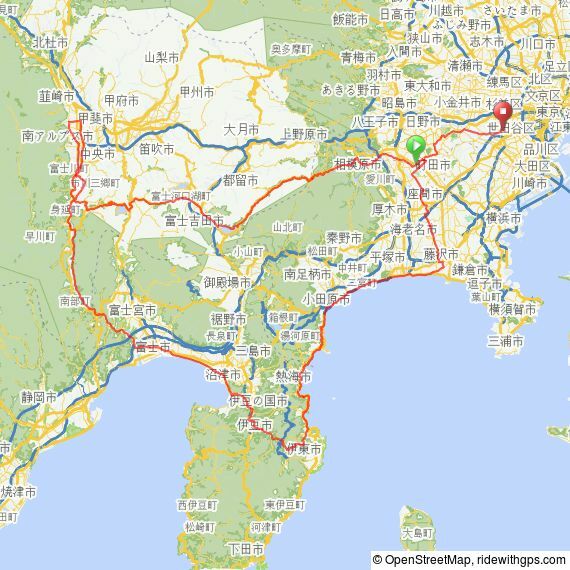 Altogether it visits four prefectures (Tokyo, Kanagawa, Yamanashi and Shizuoka). This year it was a little too late for cherry blossom season even in the cooler mountain regions, but there are plenty of purple Wisteria (藤, fuji) in full bloom everywhere. After my pre-ride of the course two weeks earlier I considered going back to the Bike Friday for its ease of taking it on a train should I not finish the ride. The week before the event I had a very busy schedule, taking friends from overseas to Meiji shrine, Asakusa, Kamakura, Mt Takao and the Tsukiji fish market among other places. Lots of walking and hiking and not quite enough sleep. However, after a final dinner on Thursday we said farewell and I slept in on Friday morning. I went for the NFE after all, to be able to compare it with last year’s ride. If I got sleepy some place in Izu I would simply find a place to sleep and cycle home at my own pace. I left home around 18:30 on Friday as I had booked a room at the Tokyoko Inn in Sagamihara, about 2 km from the start. I first set off in cycling shorts, but after about a km turned around and got changed into long uniqlo trousers and also packed a pair of regular shorts. In my luggage were long johns and long sleeved underwear as well as a light wind breaker and my rain wear. With all that gear I was covered for the full range of temperatures and weather conditions I might encounter. I even brought full fingered gloves, which I never needed, nor did I use the warm underwear. The rain wear I ended up only wearing briefly. The rooms at the Tokyoko Inn are not luxurious but clean and functional and offer all the basic necessities. In my room I finished my conbini (convenience store) dinner and went to bed around 21:40. I slept reasonably well until my alarm woke me up at 05:20. After a shower and simple breakfast I got changed into my shorts, expecting I would not need trousers during daytime until at least Yamanakako. 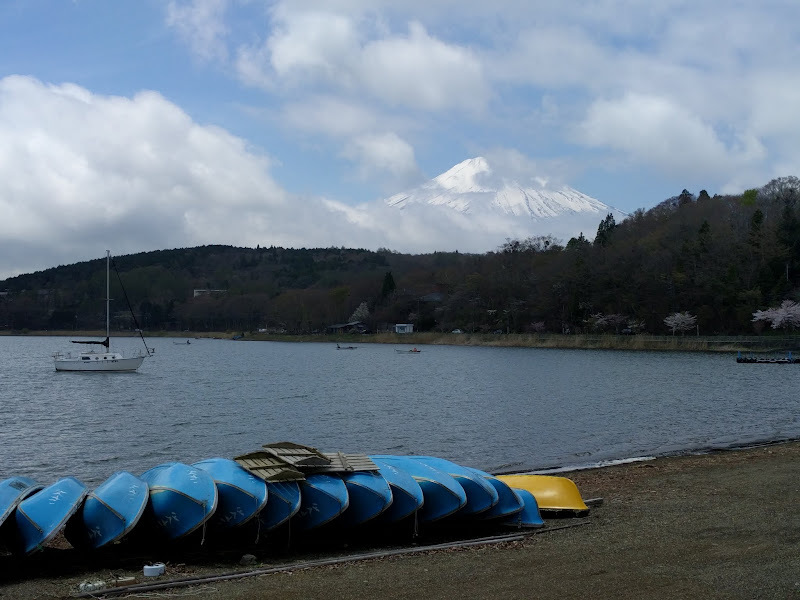 I was right – it was quite warm during the day, even up near Mt Fuji. While almost everybody at the start wore leg warmers or long lycra trousers, I was perfectly comfortable in my uniqlo shorts. I got to the reception desk in front of the Cherubim bike shop fairly late, when people had already started moving on to the start point to get ready for the briefing. After getting my brevet card and saying hello to friends and taking some pictures, I also headed over. One cyclist showed up on his BD-1 folding bike. At the briefing we were reminded of the risks of our sport: A few years ago a participant had badly crashed on the Rt300 descent from Motosuko and had to be airlifted by helicopter to the nearest hospital. “If you need a helicopter, please try to stay alive until the hospital in Kofu”, joked one of the staff members and reminded us that the ride isn’t over until we have safely reached our own front door. After the briefing the safety check started (lights, reflective jacket, bell) and then we were off. The weather forecast for Saturday was mostly cloudy, with some scattered rain during the night and on Sunday, which is pretty much how it played out. Up until Doshi village most of the cherry blossoms were gone already, replaced by fresh seasonal green everywhere. 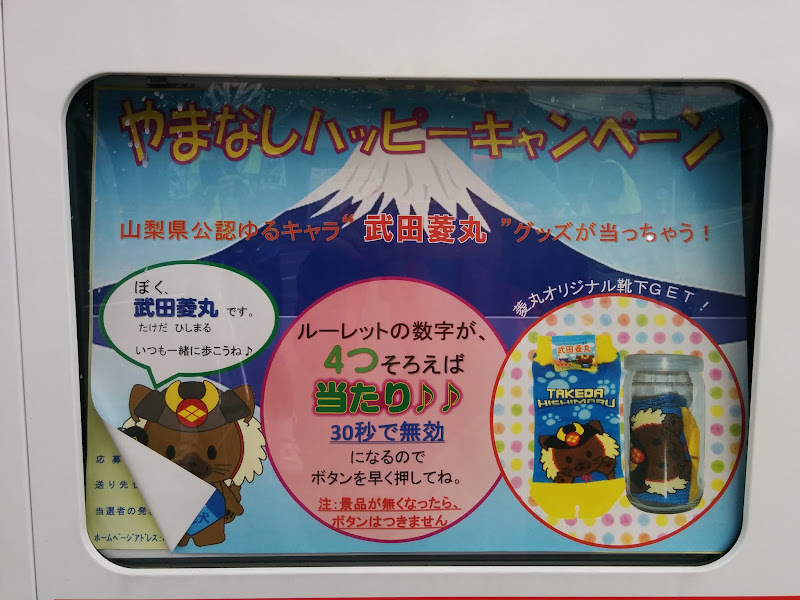 About 50 km from Machida we came across the quiz checkpoint and I took a picture of a poster on a particular drinks vending machine to prove that I had been there. I bought some milk tea and had a banana or two, before heading on after the break. I worked pretty hard up Doshi road to the village and made good time. This year I never fell behind the minimum average (15 km/h) counted from the start, unlike last year, where I was in deficit by the time I got to Yamanakako and only regained enough time on the biggest descent (from Motosuko to PC1) to stay 20 minutes ahead of cut-off time at PC1, 125 km from the start. This year I was an extra hour (1 hour 20 minutes) ahead at PC1 instead! I could recover on the descent after the pass between Doshi and Yamanakako and it wasn’t as cold as when I rode it two weeks ago. Partly that was because I arrived much earlier in the day. After the lake we joined the main road, which always tends to be busy, but at least initially we could enjoy more descending. Then after the Fuji Q Highland theme park the road quality deteriorates and stays poor for a long time, but there’s no real alternative if you want to make good time. After the tunnel behind the lake (before which staff reminded us to switch on our lights) I started the descent. I did not even put on a wind breaker because it still wasn’t too cold. Last year this had been the coldest part of the brevet route. I could descend much faster than on my pre-ride two weeks earlier, where I had arrived here after sunset, but not wanting to try out Japanese helicopter rides I was still careful. After PC1 the road was mostly flat for the next 27 km to PC2 in Minami Alps. We ended up with a good tailwind, which is always a pleasure. I chatted to a local road cyclist about our event and he took my picture. Around 15:30 I got to PC2, 151 km into the course, now almost 1:30 ahead of cut-off time – 1:10 faster than last year! 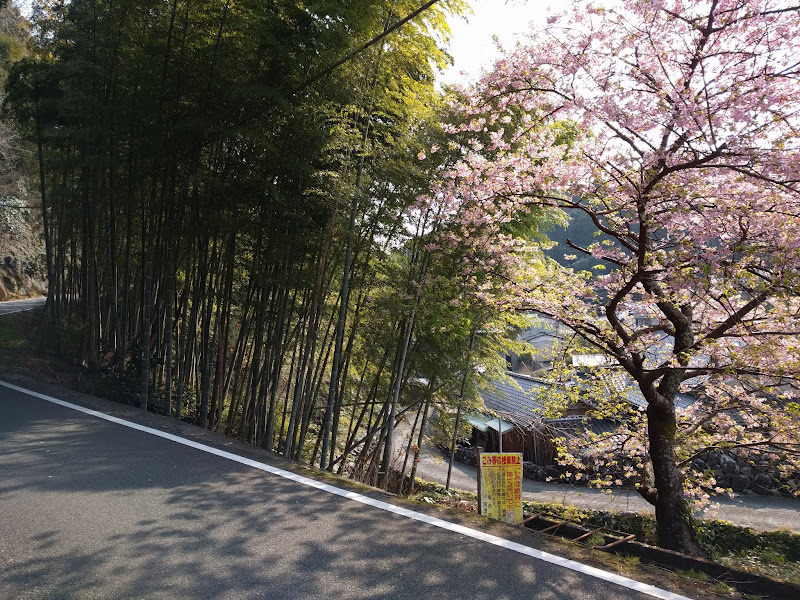 Though I was concerned about facing a head wind on the way back from Minami Alps, this part of the route has a long downhill section, so the wind doesn’t really bother you because gravity takes care of it and your legs still recover. From Kajikazawa the route joins major Rt52 along the Fuji river. We shared the roads with lots of cars, trucks and buses until we got to the Rt300 bridge near Minobu, where we crossed over to the east bank to follow the Minobu railway line. Riding in the dark now I was starting to feel a little bit tired, but not too bad yet. At PC3 in Shibakawa I was now over two hours ahead of cut-off time. I rewarded myself with some fried chicken, a walnut bread stick and some cocoa. It had started drizzling and I finally put on my rain wear, but soon found it too uncomfortable. The mesh inside the trousers was rubbing against my skin as I was still wearing my uniqlo shorts underneath. Also, the saddle felt very uncomfortable with this combination. So I found another conbini and changed into my regular trousers and my uniqlo windbreaker instead. Neither was as waterproof as the rain wear, but infinitely more comfortable and sufficient for the slight drizzle that kept coming and going. About 4 hours after I had stopped at PC3 I arrived at PC4 near Shuzenji in Izu, after a long urban ride through Fuji City and Numazu towards the centre of the peninsula. Still almost two hours ahead, I treated myself to a cup of coffee and a bun with Wiener sausage. From here to the end of the ride I would see more and more people taking naps, but I did not join them yet. I climbed about 8 km to the pass on Rt12 over to Ito. This was in the wee hours of the morning, so none of us could admire the beautiful views I had seen here two weeks earlier. The long descent to Ito was very welcome, giving me a chance to rest before the four major climbs along the coastal road to Odawara. Near Atami I finally did lie down for a turbo-nap of only 10 minutes on the wet asphalt of a conbini. I set my alarm so as not to oversleep, rested my head on the rain wear bag as a pillow and dozed off. Next to me two other participants were sleeping. 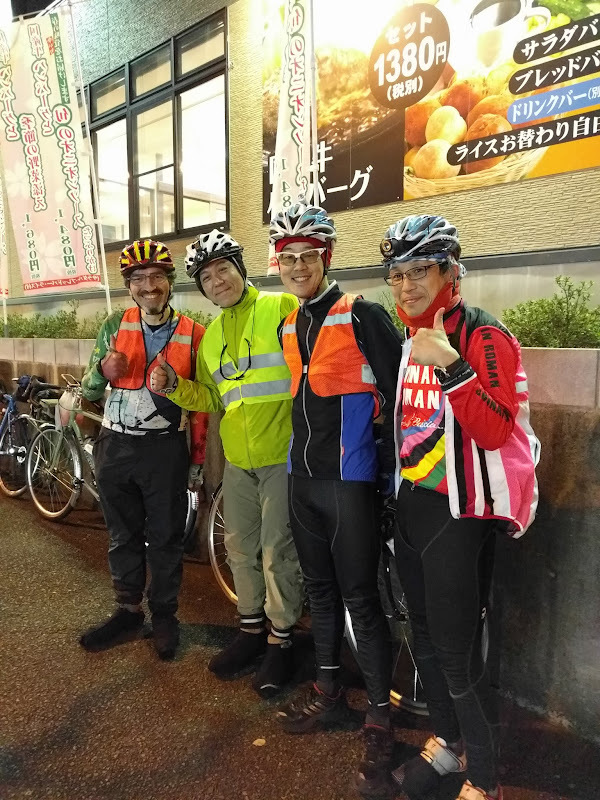 I found cyclists sleeping by the road side again and again as I was making my way to Odawara and on to PC5 near Fujizawa (90 km from PC4). A few breaks with coffee and food helped to keep me going. I knew I had a decent time buffer and was happy to eat into it to make the pace more comfortable. After Odawara the road flattened out but also got busier with Sunday morning traffic. 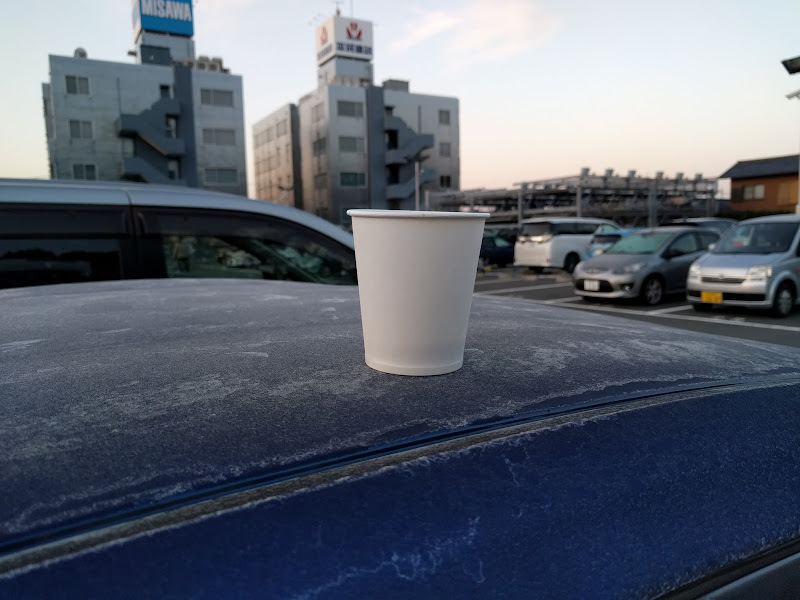 At 06:24 I finally rolled up in front of the Circle-K store that served as the final control, PC5 – exactly one hour before closing time. I had 3:36 to cover the final 36 km, which I means I could make it with an average speed of no more than 10 km/h. With traffic lights I usually average around 18 km/h in central Tokyo. So I should have been fine. My shoes and socks were wet from water from puddles that had splashed up. I was tired but only 36 km away from the goal, which is almost nothing if you’ve already done 10 times as much, right? I struggled on, checking the time and remaining distance on the GPS regularly. I did another conbini stop for the toilet and food. The rain got worse. When the light turned green at the Rt246 intersection, I started up but noticed a funny wobble. I came to a halt on the opposite side and looked back – my rear tyre was complete flat. I had suffered a puncture! This was 16 km from the finish line. I knew how hard both Shintaro and Tim had struggled when they mounted the tyres on my rims, so I wasn’t looking forward to the repair, but it was my only chance. A quick check found a glass shard of 3-4 mm embedded in the tread of the rear tyre and I pulled it out. I had two spare tubes with me, one in the front bag, one under the saddle, so theoretically I should have been able to recover from the problem, as long as I didn’t run out of time. My fingers got greasy from the chain when removing the rear wheel, but that was a minor inconvenience. I got out my tool kit and tried prying the tyre off the rim using the plastic tyre levers. On the Bike Friday I could have done this by hand and the whole job would have taken no more than 10 minutes, but with the tubeless-ready Velocity Blunt SL rims the tyre beads are firmly seated and do not come off easily. It seemed like I would almost break the tyre levers before the beads would move. I just didn’t have the right technique. I tried and tried and had almost given up when I finally managed to work my way into loosening it from one point and from there around the whole circumference. I could then remove the punctured tube. I installed the spare tube and slightly inflated it so it would hold its position, then began the equally tricky part of getting the bead to slide back over the rim, without puncturing the tube or tearing up the side walls. Then get the wheel back in, with the rotor sliding into the brake caliper and the cassette engaging the chain and derailleur. Somehow after some wiggling and more grease on my fingers everything came back into place again. Then inflate the new tube and hope it doesn’t explode from being pinched somewhere. I knew I wasn’t giving the tyre much pressure but the only pump I had was a mini pump I bought 4 1/2 years ago for my Bike Friday with its much less voluminous tyres. I checked the time when I thought I had just enough air to risk going back on the road – 09:09, only 51 minutes left before 10:00. I collected all my bits and rode off. I lost time at many red lights. It was only when I got down to about 3 km from the finish that I got confidence I would still make it. In the end I rolled up in front of the Cherubim bike shop at 09:56, 4 minutes before event closing time. I think I had been the last person still on the course, as I didn’t see anybody else arrive after me. Everybody had been waiting for me. It was a great relief to have made it after all. This was my first puncture in any of the brevets I have done since 2012. After the event closed, everybody helped breaking down the reception desk and tent and packed things up. We posed for a group photograph, said goodbye until the next event and we headed home. First of all, my thanks to AJ NishiTokyo for this great event 🙂 Everybody got home safely, whether they DNF’ed or completed. It’s a great course and we were mostly lucky with the weather. Like at the brevets in Izu (200 km) and the Fuji 300 km I was very happy with the Elephant NFE. It works very well for me. I make good time on it. Carrying luggage on the front carrier is surprisingly aerodynamic, as it shields the rider from wind and everything is always within easy reach. I’m planning on getting a bigger front bag though. The difficulty of changing tubes with my current rim / tyre combination compared to the Bike Friday is a bit of an Achilles heel for this bike. I will have to rethink that. One option would be to move to a completely tubeless setup with sealant, which would at least take care of minor punctures, but I will have to see what tyres will work for that and what rim tape, valves and sealant to use. The Bike Friday will gets its pump back and the NFE will get its own bigger pump. I will also look for different rain pants. I have a very good Polaris rain jacket, but the trousers from a set I recently bought at a home center to replace a pair torn in a crash in November did not work well enough for long rides. With my biggest ride of the year so far, I am now up to 44 months of at least one century ride (160+ km) per month. Last April I for the first time managed to complete a 400 km brevet under the 27 hour time limit. 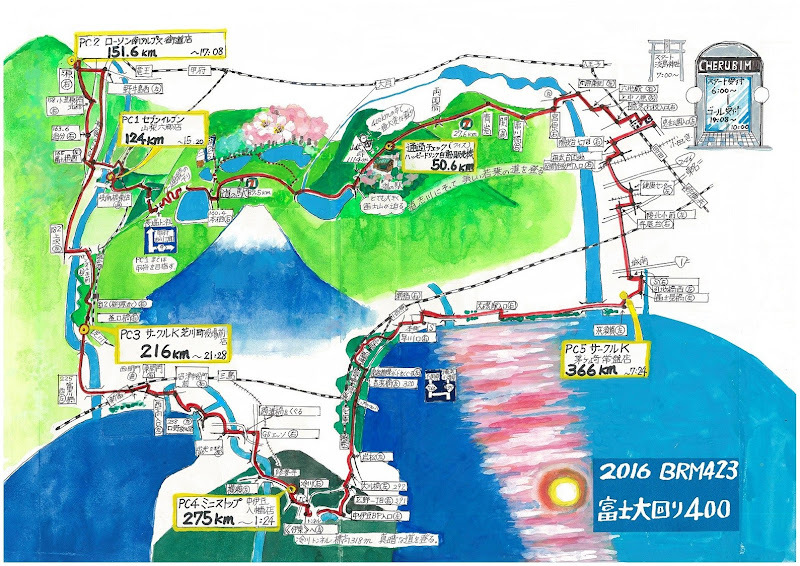 It was 2015BRM418, a 400 km loop around Mt Fuji with AJ NishiTokyo (BRM418西東京400km富士大回り). I think it greatly helped that two weeks before the event I pre-rode the course at my own pace. Having done the same course on a rainy Easter weekend made the actual event seem a lot less intimidating than it would have been otherwise. 1) I decided not to do the full 400 km brevet route plus almost another 60 km to get to the start and home again from the finish. I cut out about 50 km in the middle (PC1 to PC2 and back to where the courses passes near PC1 again), getting me closer to 400 km instead of last year’s 460 km mammoth ride. 2) I didn’t start to prepare for the ride until a little before midnight on Friday. I originally wanted to ride from Sunday to Monday, but then had to move it up a day. Consequently I only slept a bit over 5 hours before the ride, which is not good. I ended up getting very sleepy, more about that later. 3) On the upside, it didn’t rain, which helped. I still wore my rain gear, but only for the cold at times. 4) I did the ride on my new bike, the Elephant Bikes National Forest Explorer, on which I had already completed 200 km and 300 km brevets in February and March. I don’t have a rinko bag for the Elephant NFE, so aborting the ride and taking the train home like I did after my DNF (Did Not Finish) in 2014 was not an option, as it would have been with my folding road bike, the Bike Friday Pocket Rocket. I left home around 07:30 and cycled to the starting point in Machida 28 km from here. From there I followed the course through Sagamihara to Doshi road, up a mountain valley towards Lake Yamanakako near Mt Fuji. 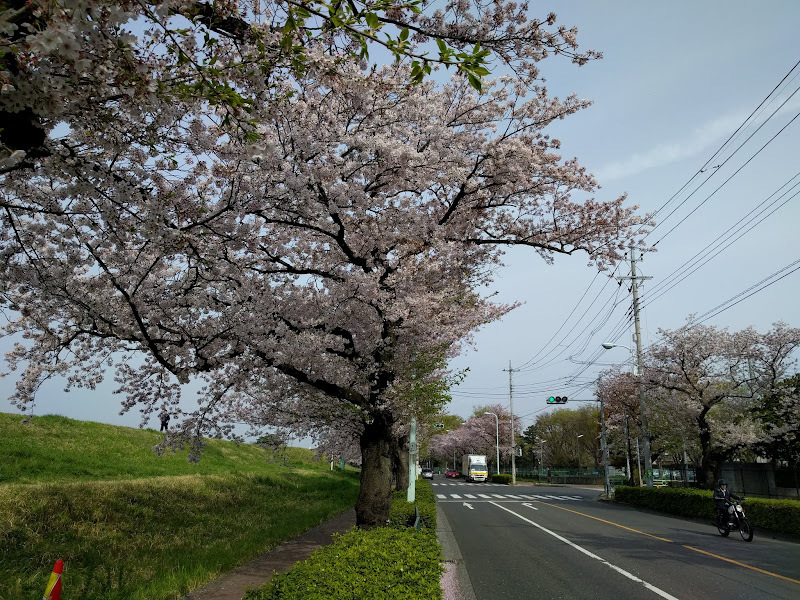 While the cherry blossoms were well past their prime down in the Kanto plain, the higher up I got the fresher or even immature they still looked. 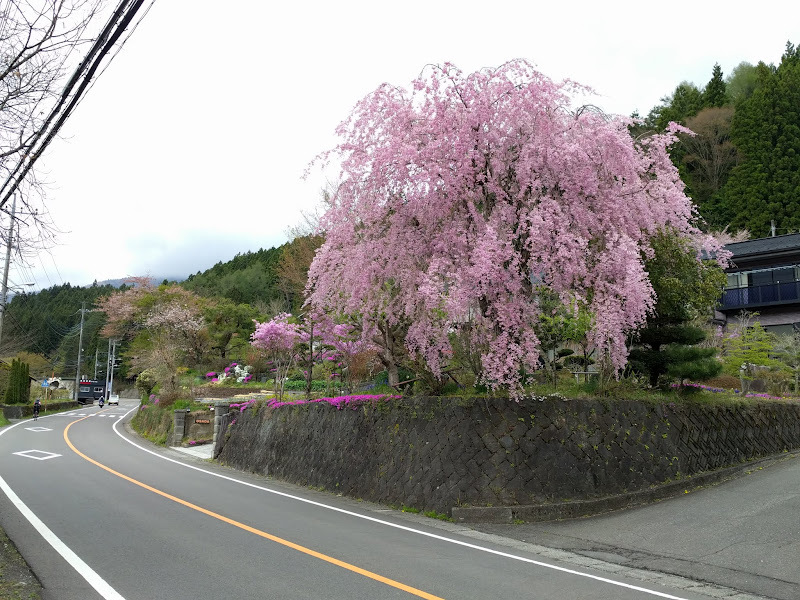 Before I reached Doshi village they seemed to be in full bloom (“mankai” in Japanese). 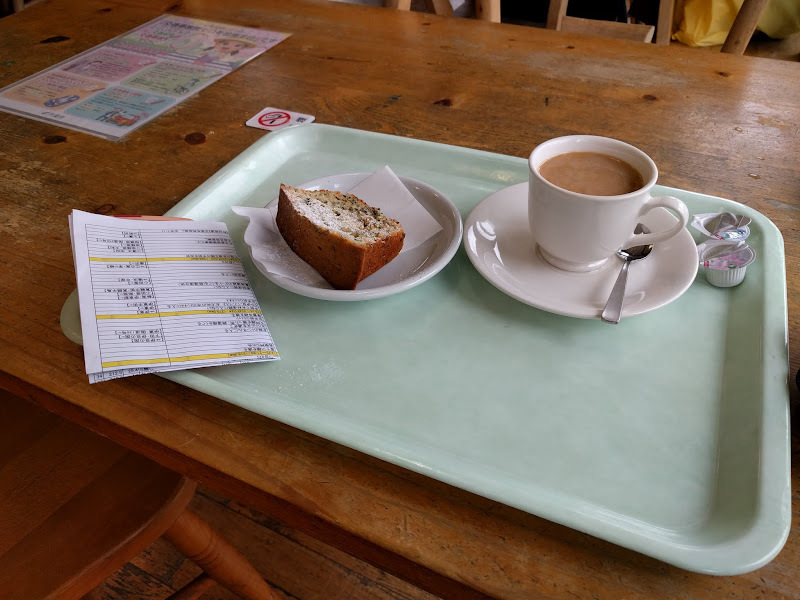 I stopped for coffee and cake at the Doshi Road Station (どうし道の駅, Doshi Michi no Eki). At the top of valley, on the final climb to the pass the cherry trees either had no blossoms at all yet or just a few blossoms with the rest of the branch still as buds. It was markedly cooler once I got out of the tunnel before the descent to the lake. 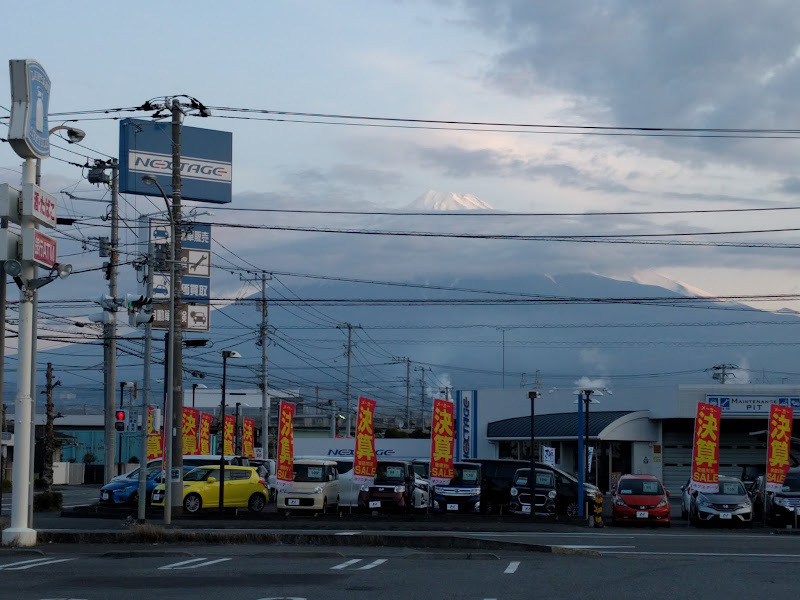 Soon I saw my first views of a big Mt Fuji. I was lucky and it was mostly unobscured. I stopped for pictures several times, on the way to the lake and then on the bike path along the lake shore. From the west side of Lake Yamanakako I joined major Rt138/139 that would take me to Lake Motosuko. I had some food at a convenience store and put on more clothes again. Rt139 near Fujiyoshida and Kawaguchiko is not only busy but also very rough and really could do with resurfacing, but at least the wide tyres of the NFE took the edge off the bone-rattling ride of the crumbling, patched-up and pot-holed asphalt. 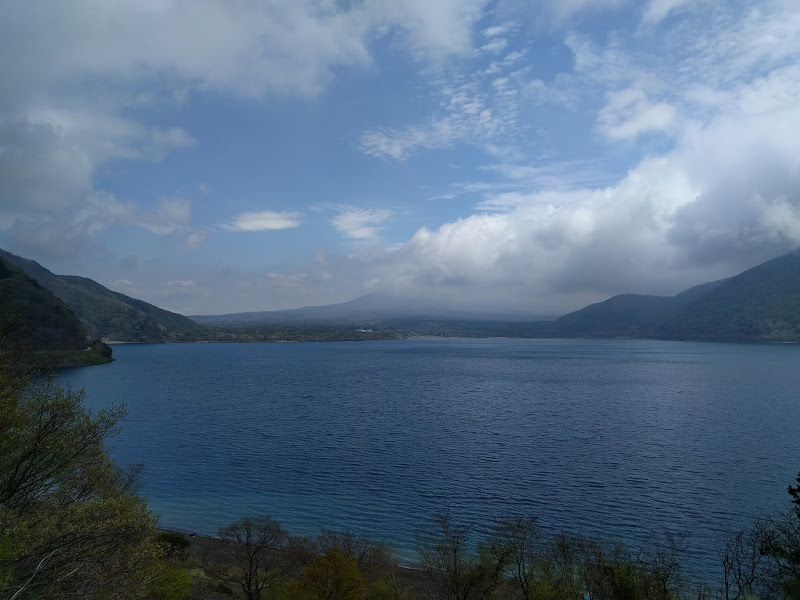 I passed many cars as the road went downhill towards Kawaguchiko, then it started climbing again towards Lake Saiko, before finally descending again near Lake Motosuko. 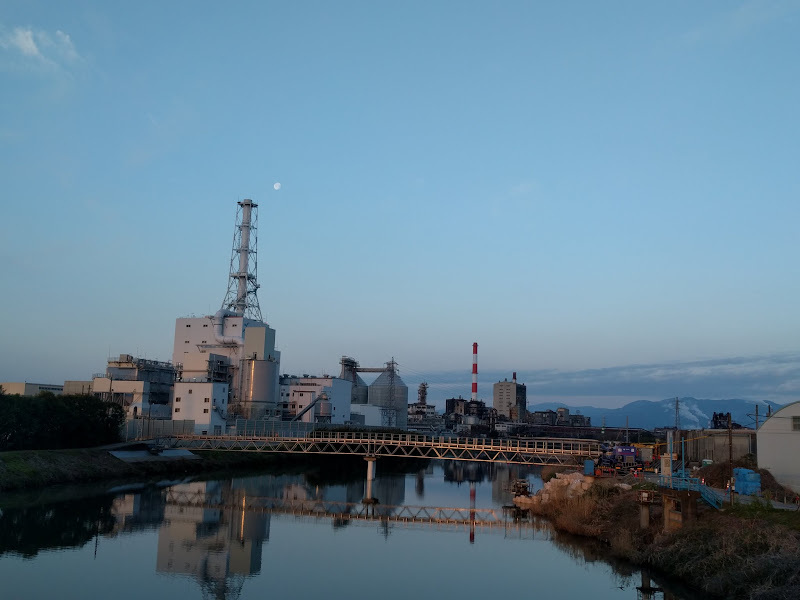 By the time I reached the turn-off to Motosuko, the sun hat set and it was rapidly getting dark. I took a few more pictures at the deserted lake in the fading evening light before entering the tunnel. On the steep descent on Rt300 I kept the speed down, not wanting to take any chances misjudging a corner in the darkness. Finally I got to the turn-off to another climb and tunnel over to an adjacent valley. From there the route went downhill again all the way to PC1. Looking at my time, I decided to cross the Fujikawa river here and head down Rt52 after a food stop. Traffic wasn’t too bad. Eventually the course crossed over to the left bank of the river again, where Rt300 joins Rt52. It followed the Minobu railway line down to Shibakawa. I remembered this part of the route as more hilly from last year’s ride than I experienced it on this ride. 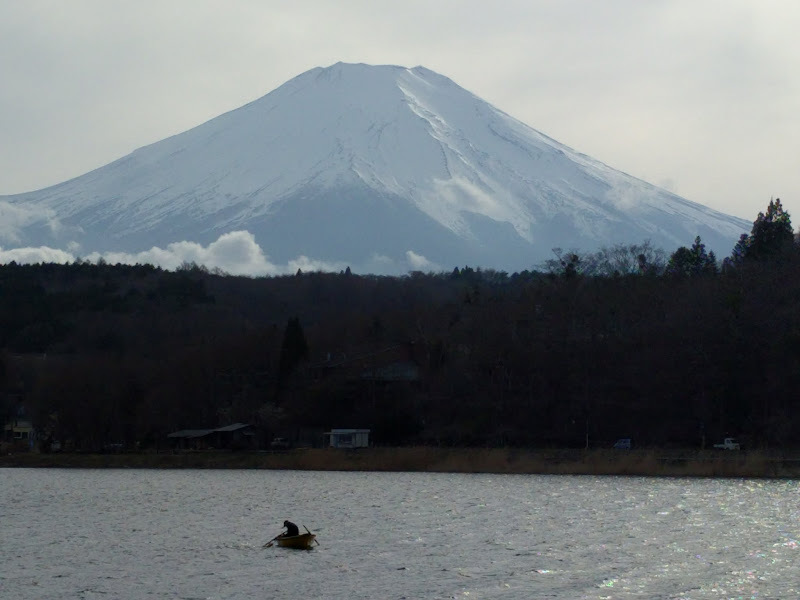 From PC3 it wasn’t that far from the coast in Fuji city, but I started yawning more and more. I was about 200 km from home by then. I was very glad to cross the Fujikawa river and turn east, towards Mishima. 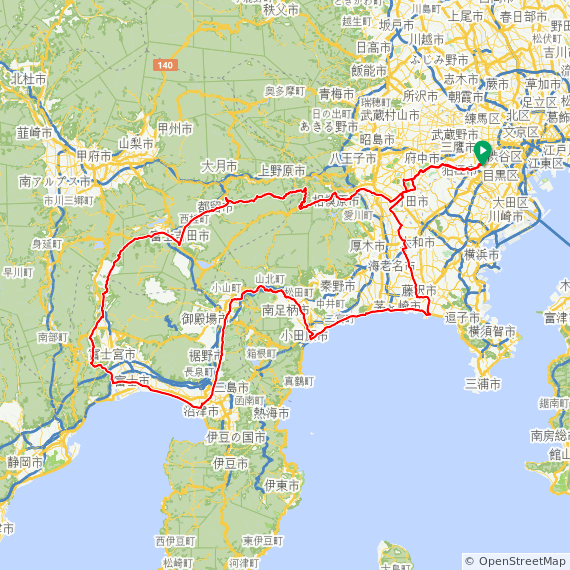 I did OK on the urban stretch along the coast and until I entered Izu. 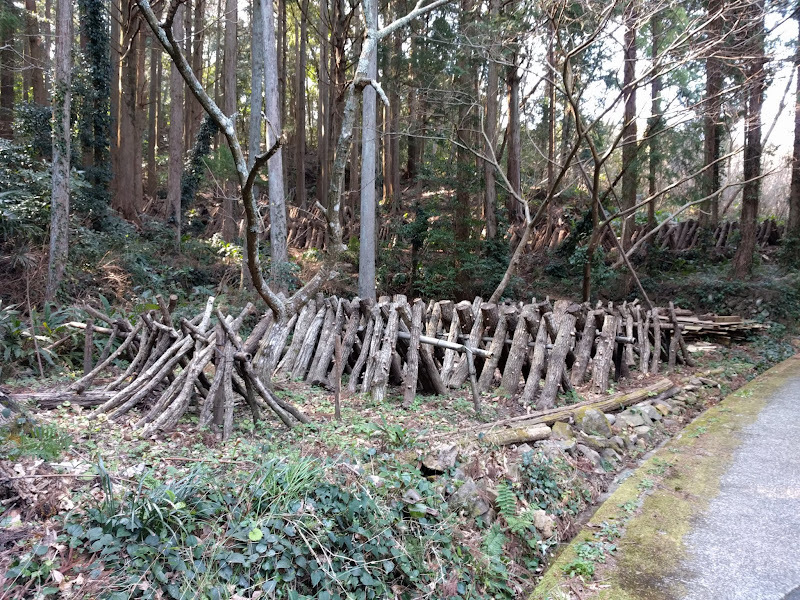 The closer I go to Shuzenji, the more I felt the night time cold and the tiredness. 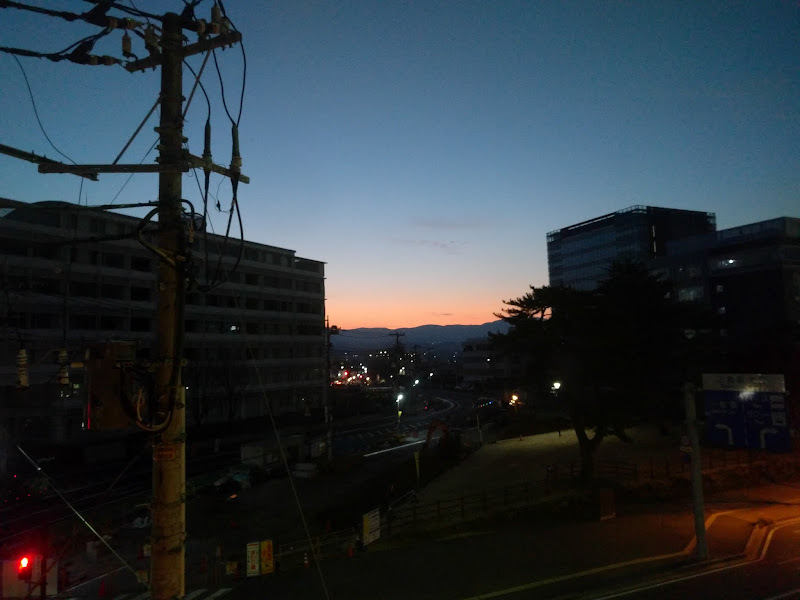 When I finally arrived at PC4 in Shuzenji in the interior of Izu around 05:00, I got a cup of coffee and took a one hour nap outside, leaning against a wall. After I woke up again, I got back on the bike and started climbing Rt12 to the pass over to Ito. The sun was up by then and I enjoyed the early morning views. The cherry blossoms around there were beautiful. The long descent down to the coast in Ito gave me some recovery time, but there were still another four climbs over the next 30 km to Odawara, until the coastal road finally flattened out. Near the fake Atami castle I found some trees with piles of dry leaves underneath, which invited me to lie down again. I used my rain gear bag as a pillow and rested on a futon of dried leaves, only metres from the busy coastal road and its weekend traffic. An hour later I woke up again, refreshed enough to ride home. In Odawara I stopped for cherry blossom pictures at the castle moat. I probably would have enjoyed the ride more if I hadn’t started with the ambition of staying close to brevet speeds. I would have slept earlier and longer and would have had more fun on the last part. Still, I ended up with close to 400 km and 3800 m of elevation gain with many, many beautiful views. The night time part of the ride would have been easier with warmer clothes too. I was over-estimating how warm it would stay after dark. I am seriously considering trying the Bike Friday again for the brevet ride. It would make it easier to cut the ride short and take the train home, should I lose the battle against sleep. I love both my National Forest Explorer and my Bike Friday, one for its comfort, the other for its versatility. They are both great bikes and Japan is a great country to ride them in.